Usually a handshake only becomes historic when a remarkable deal has been made between two sworn enemies. Yitzhak Rabin and Yasser Arafat. Nelson Mandela and F.W. de Klerk. Reagan and Gorbachov. Not in Turkey. Here, it’s already historic when two political opponents, CHP leader Kilicdaroglu and Prime Minister Erdogan, finally shake hands and talk for an hour about the biggest problem the state has faced in its entire history. The nation’s papers speak of a ‘historic step’, a ‘historic breakthrough’ even. Sorry, I have tried, but I really don’t see much reason for optimism here. Some people see reason to be optimistic because the leaders of the two biggest parties now both recognize that there is a Kurdish issue that needs to be solved through democratic means. I’d almost say: isn’t that a reason to be pessimistic? After almost a century of oppression of Kurds and almost thirty years of horrible violence claiming thousands of lives, the two biggest parties sit down and agree to see what they can do to solve the problem. Is it only that far that Turkish politics has advanced? Okay, better late than never, but to see it as a sign of hope – no. That it is only now happening says something about their stance so far, doesn’t it? The starting point of the talks between Kilicdaroglu and Erdogan was a ten point roadmap towards solving the Kurdish issue, put together by the CHP. One of its important aims is to establish a parliamentary commission of wise men and women to search for solutions. Nothing wrong with that, of course. The point is, though, both leaders immediately stressed that support is needed from all parties in parliament. While saying that, they very well knew that the ultra-nationalist MHP will never support it. The MHP says there is no such thing as a Kurdish issue, there is only terrorism. The AKP and the CHP say they will keep pressuring the MHP, for months if necessary. For months? A great way to lose momentum. If Kilicdaroglu and Erdogan are serious about this, why did they not start neglecting the MHP as soon it made clear they refused to cooperate, which was right after the Kilicdaroglu-Erdogan talk? Why does Kilicdaroglu propose to not speak about ‘the Kurdish issue’ but rather about ‘terrorism’ to get the MHP on board? Why give a party which by a policy of denial places itself outside the political arena the power to redefine the issue yet again as a terrorism problem? If you say your goal is to solve the problem, how can you then possibly avoid even defining it honestly? Maybe they need the MHP as an escape route. What if Kilicdaroglu’s party in the end doesn’t back him up? Not out of the question, since he is not that solid in his position as party leader. There are many staunch Kemalists in the CHP who could not live with the fundamental changes that are needed in, for example, the constitution to really solve the Kurdish issue. And Erdogan? He is unchallenged as party leader, but is he strong enough as the country’s leader to push through changes? You could say ‘yes’, since he has done so in reducing the power of the military. But this is something else. Weakening the military was not a controversial issue among the voters, and he only angered people who were already against him. But his voters are not only pious, middle class Muslims, as they are usually defined, they are also nationalist. Like the average Turk: the state has been very successful in making people believe the nationalist truths the Turkish republic is built on, coming together with the slogan ‘one flag, one nation, one language’. No party in Turkey can survive without being nationalist. The MHP thrives on it, but the AKP and the CHP are in essence nationalist as well. Does Erdogan dare to alienate his voters? Or will he find a way to convince them – maybe just by telling them this is what needs to be done? What also worries me is that the CHP and AKP suggest they could solve the matter just by themselves if the other parties in parliament don’t want to cooperate. To do that, they could for example set up a commission outside parliament. One: the only place where the Kurdish issue can be solved is inside parliament. Two: the issue cannot be solved by talking about Kurds, but only by talking with Kurds. 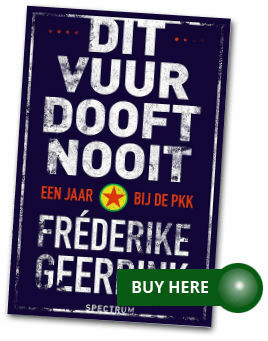 In other words, with the pro-Kurdish BDP. The BDP has stressed several times that they support the idea and are open to talk. So why do Kilicdaroglu and Erdogan still suggest they can work on the problem as just the ‘two of them’? Why don’t they – soon! – meet with BDP co-chair Selahattin Demirtaş and shake hands with him and agree to work together? Why haven’t they done that already? Are they already afraid of the consequences of their handshake? Afraid that shaking hands with the BDP would suggest they admit they will have to talk with the PKK too, something that they know needs to be done but can’t easily ‘sell’? Apart from the questions that can be raised, there are facts. Daily realities. They are another reason for me not to be hopeful. The arrests in the KCK probe continue: earlier this week, ninety (!) medical students were taken into custody and almost on a daily basis BDP officials are taken from their homes. This week, the mayor of (earth quake stricken) Van was arrested, sparking demonstrations. There are ongoing clashes between the army and the PKK, many of them never making headlines in the Turkish media. Soldiers and PKK fighters die, and this week a young boy was killed by a police bullet at the funeral of a PKK fighter. Last week, at several universities in Turkey, nationalist groups attacked Kurdish students, who were not protected by the police but arrested instead. Let’s not forget Uludere. The PKK has started kidnapping civilians and soldiers again, sometimes one, often groups of three to ten people. The tension, the frustration, the anger among Kurds is rising. Did Erdogan and Kilicdaroglu speak out about these things? We know how Erdogan deals with Uludere – read more here and here. Erdogan supports the KCK trials and does so rather passionately. Kilicdaroglu never spoke out strongly against the KCK probe, about racist violence against Kurdish students, about the AKP policies that have increasingly treated the Kurdish issue as a terrorism problem over the last year or so. And from these men we now have to believe they are sincere about solving the Kurdish issue? Forgive me for being somewhat sceptical. But of course I hope I am wrong. Who knows, one day we might look back and define this as one of the crucial developments on Turkey’s road to a solution. Maybe Erdogan will be President then. Will he, as the highest representative of Turkey, shake hands with the state’s worst enemy, who is imprisoned on Imrali island now but who – everybody knows it – needs to be part of the solution? Unimaginable? It is. Now. But historic handshakes always were. Excellent post cutting through a complex web of political opportunism, nationalism and downright lies! Erdogan (and AKP) wants to swallow MHP by being nationalistic (as it is happening for the last year) and he immediately to Kılıcdaroğlu, that CHP should convince MHP. So Erdogan is just trying to manage the situation. 1. What do you mean by “almost a century of oppression of Kurds” ? I mean I hear it a lot from you and from some commentators here and I would like to see explicitly what do you mean by this expression. I am not opposed to that expression by the way but I’d like to have an insight because it is used often alone. 2. Forget Erdogan. His tactics and stance is well known. What could CHP (Kılıçdaroğlu) do ? Do you have any interesting solution in your mind ? 3. Don’t you find it bizarre that BDP (a party that has been elected to represent Kurdish people in the Parliament) canalize every serious discussion to Ocalan and to PKK ? So aren’t they profiting from the political deadlock ? No news about recent big attack of PKK which yielded 8 death and 19 injured soldiers ? Isn’t it bizarre all it is happening after this historic handshakes and while CHP and AKP were keen on further discussion with BDP and if possible with MHP ?